Building the Tamiya TT01 Type E by Chris Lillywhite. 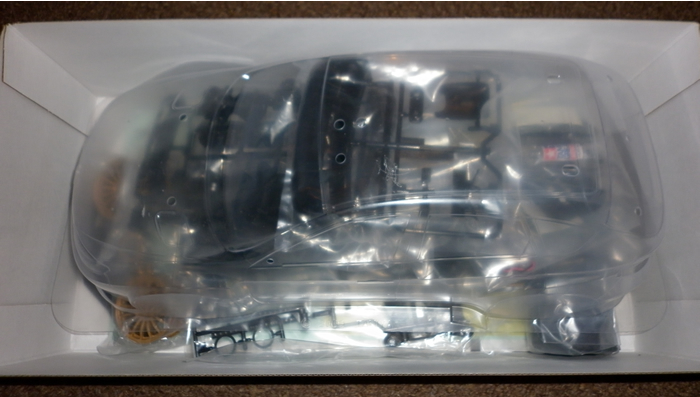 This is a build review primarily for someone who is looking at getting their first 1/10th on road chassis to either use on a flat surface such as an unused car park, or to venture into the world of 1/10th scale on road "touring car" racing. I would like to mention that although this car has a rally body shell on it, the suspension is not sufficient for off road surfaces and may cause damage to the car if used off road. 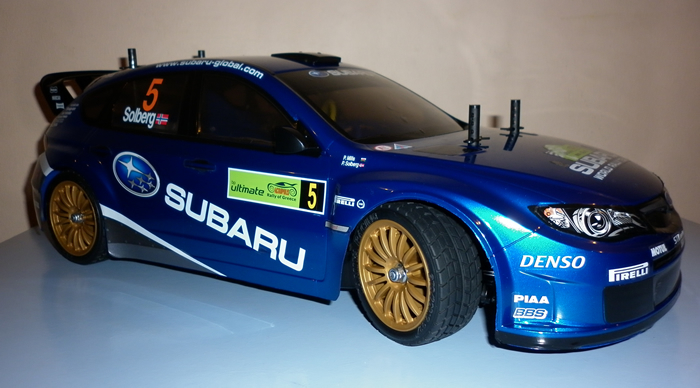 The car in the review was supplied with a Subaru Impreza WRC 2008 bodyshell, Tamiya Electronic Speed control, standard "silver can" 540 motor and a TLU-01 light kit for added realism. 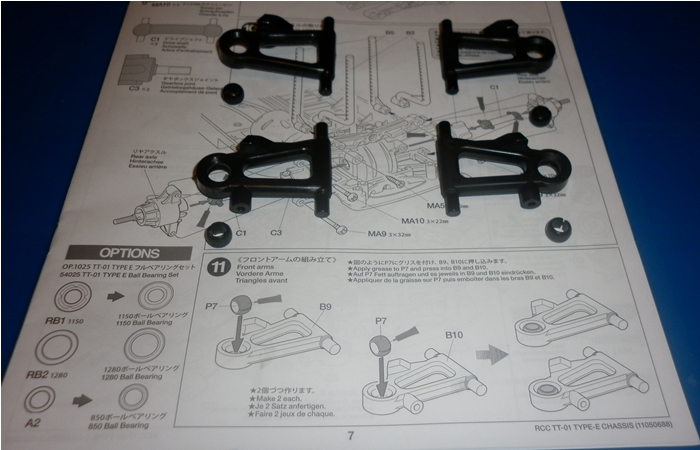 There is also a printed list of "option parts" made by Tamiya included with the kit, should you later wish to purchase them to enhance the look and performance of the car. I have mentioned these in more detail at the end of the review. 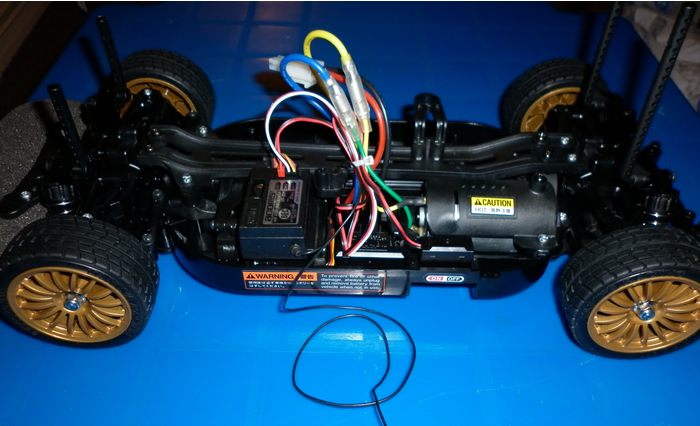 The chassis kit in the review does not come with the transmitter, receiver, steering servo, 7.2v battery/charger and the tools needed to build the car. These items will need to be purchased separately to complete the build, but I have completed the review as if you have purchased them at the same time as buying the car. A good Phillips screwdriver and a set of scissors are the only tools I could suggest you need for completing the build, as the kit is aimed at the novice who probably does not have access to more technical tools. Should you have any questions about what does or does not come with a kit when buying one from Fusion Hobbies, we are only an email or phone call away. 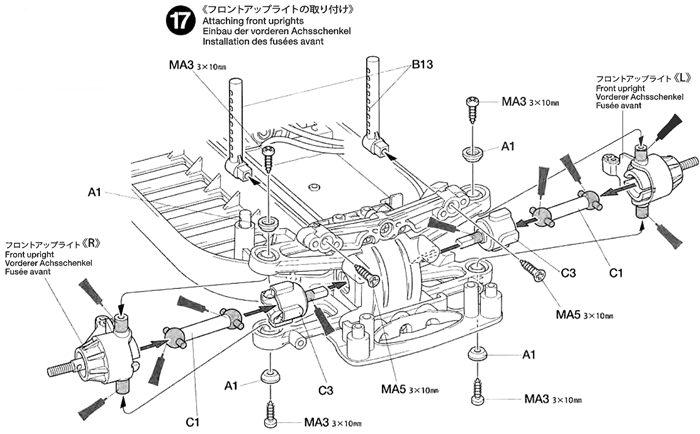 Although this is not a top level competition kit, the parts quality is still very good and the manual is very easy to understand. The parts in each step are to scale, which is very useful should you need to make sure you have the right parts for the step you are following, especially with the different size screws. The best advice I can offer is as with any kit, is take your time, do not over tighten any screw fixing and study the diagrams carefully. So you do not get confused with this review, the text for each step is below the picture of the step covered. The first step of the build involves building the spur gear assembly, greasing the bearing and assembling it into the chassis. 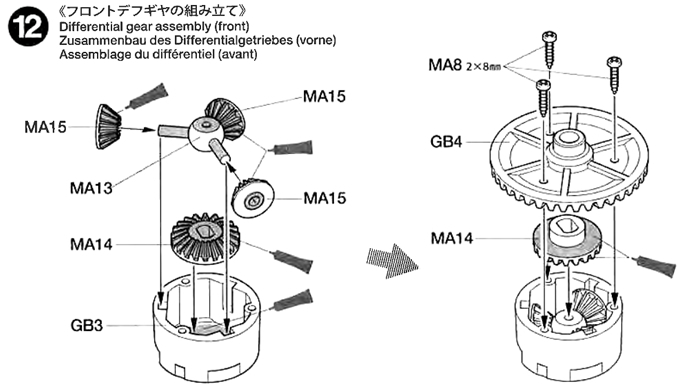 You may find it useful to use a little dab of grease on the MA11 shaft to help it stay inside the propeller joint. The next step is to install the propeller shaft into the front and rear couplings and to screw in the battery strap mounts. Use a little bit of grease on each end of the propeller. 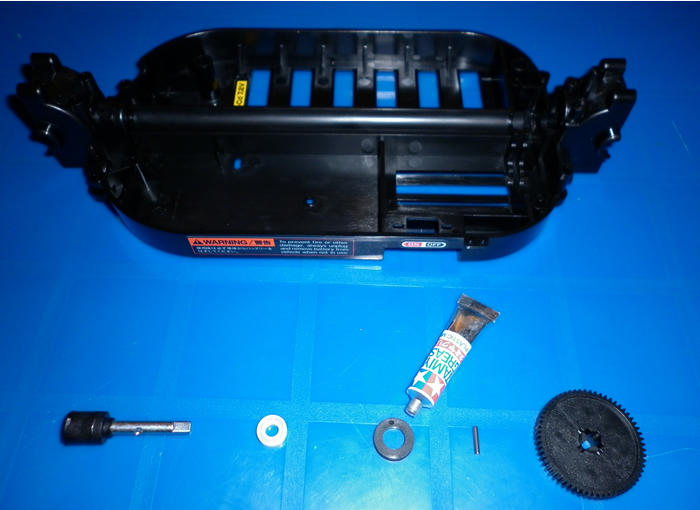 Then, you need to install the motor mount onto the motor and attach the pinion gear, using the included allen key. Be very careful not to lose the grub screw as it is probably the smallest part in the whole kit! With the motor now ready to be put into the chassis, it's now time to focus on getting the gear mesh of the motor assembly correctly lined up and attaching the upper mounting with 4x MA3 screws. 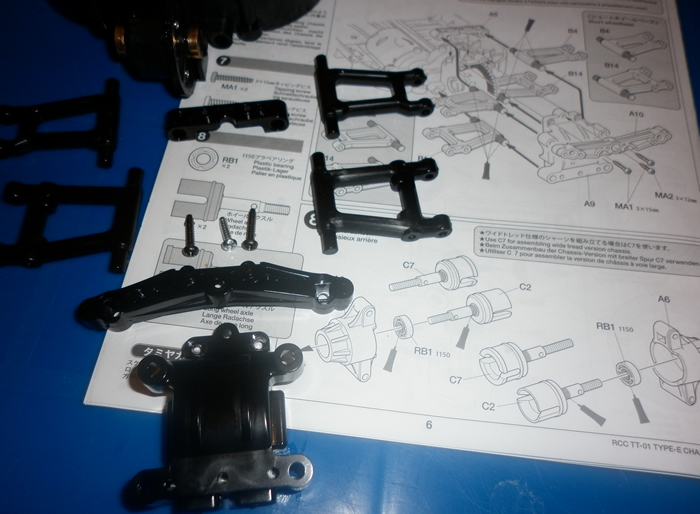 The fifth part of the build is to build the rear differential assembly. 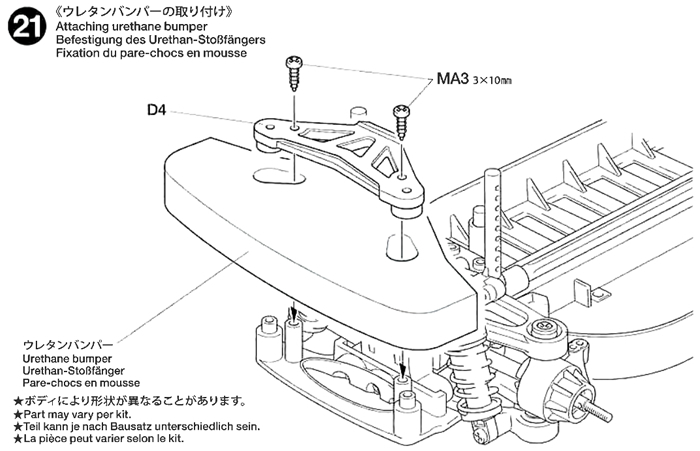 As this is a basic kit, in my opinion, Tamiya have designed this part to ensure it can be assembled by someone who knows very little about model cars and will have no problems when following the instruction manual. Assemble and grease the gears. Then 3 screws hold the whole differential together. With the rear differential now built, it is now time to install it into the chassis. 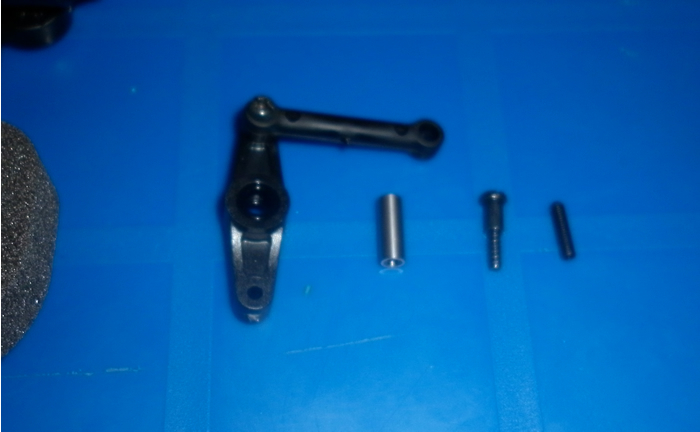 Now, to assemble the rear wishbones onto the chassis incorporating the use of part A5, the upper hinge pin mount. The kit I was building uses a short wheelbase. 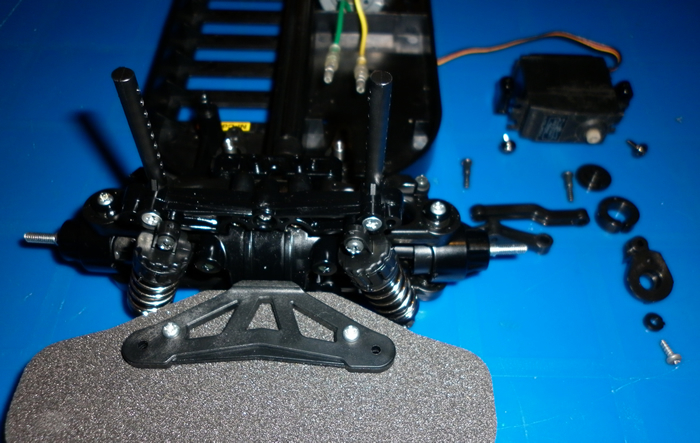 You also need to attach the upper rear suspension mount at this stage too using 3 x 12mm screws. The instruction manual is very detailed as to how this is all assembled. 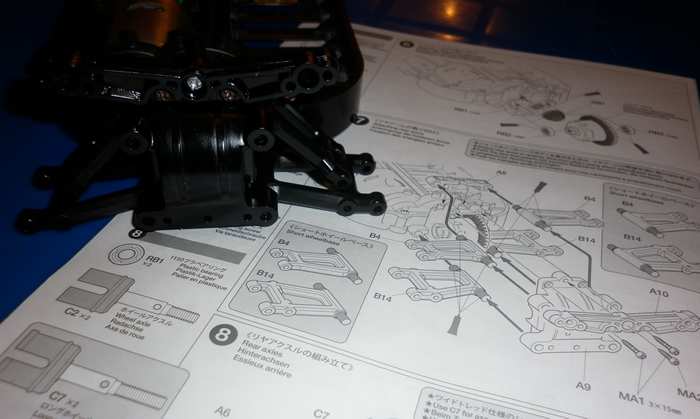 The next stage is to build the rear axles. 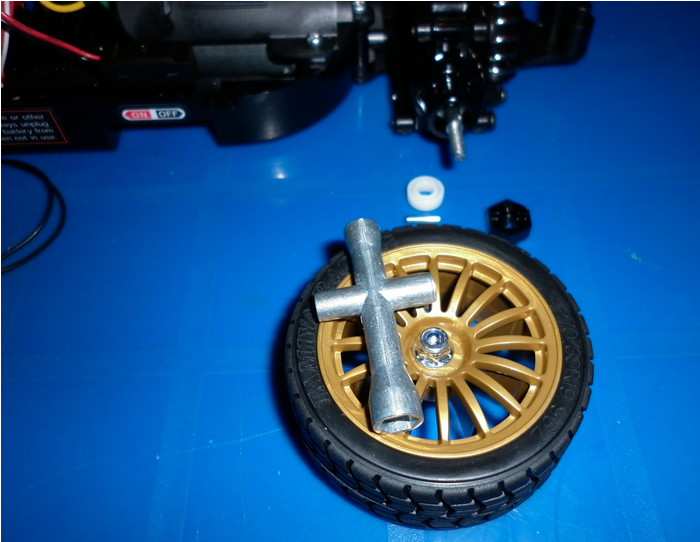 These parts appear to look very durable and therefore put up with a lot of crashing which is very useful if you are new to r/c cars and crash :) Note that the kit comes with plastic bushings for all moving parts in the drive train, so apply a small amount of grease to prolong their life. Now it's time to get the rear bumper attached. 5 screws in all hold this in place. 2 of which are countersunk to lay flat with the bottom of the chassis. 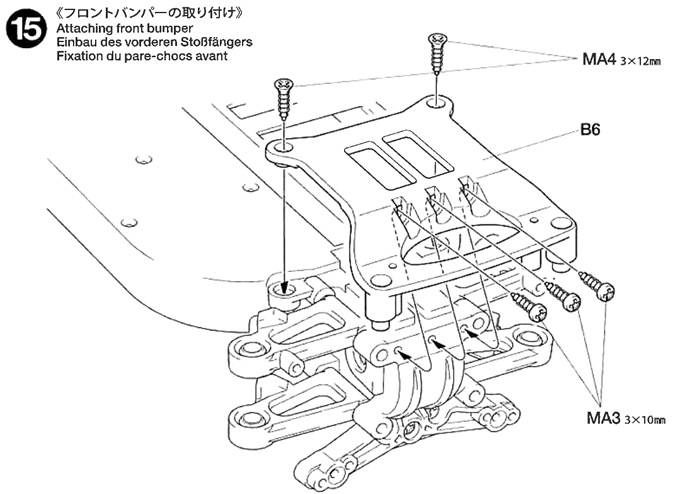 As you can see, this step is where the rear axles and body posts are attached to the chassis. Use a little grease inside the driveshaft cups to prolong their life, along with the drive shafts. 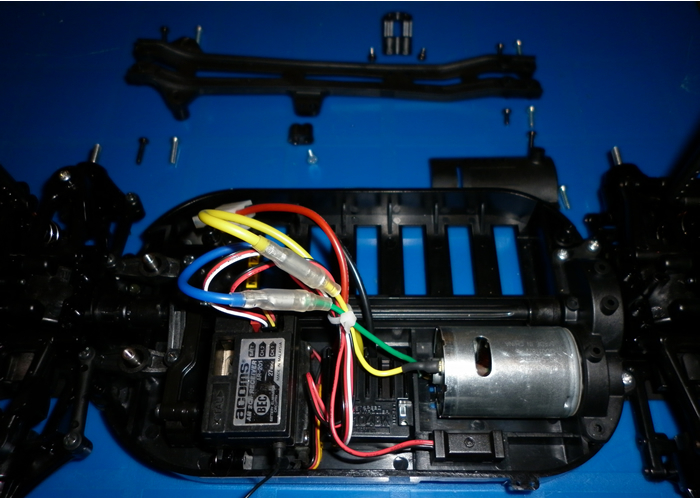 Now, with the back end of the car starting to take shape, the instructions focus on the front end of the car. In this step, the front wishbones are assembled. Again, a little grease is needed. The 12th stage of the build is to assemble the front differential. 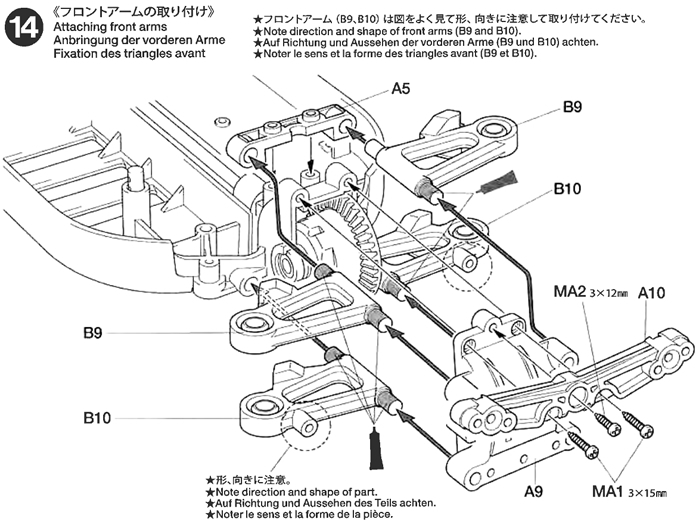 It is identical to the rear differential. 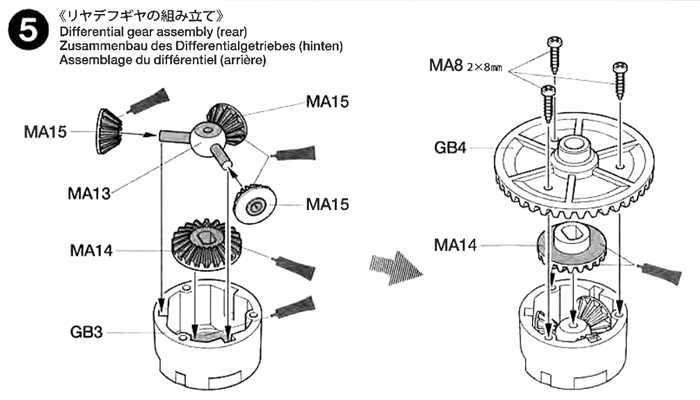 Grease the gears, assembling them into the gear casing, then complete with 3x8mm screws. Getting the front differential installed is relatively easy. Again, just make sure grease is used on the bearings to prolong their life. With the build now starting to resemble a car, it is time to get the front wishbones (the manual calls them arms) put onto the chassis, in a similar fashion to the rear wishbones that were put on earlier. Now, the front bumper mounting is installed. It is identical to the way the rear bumper is put on. Here the front uprights are partially assembled, ready for fitting. 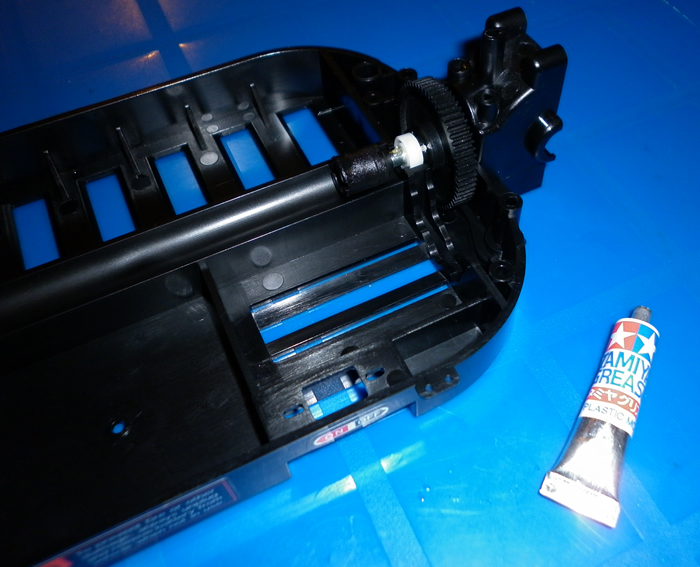 Again, more moving parts are put onto the chassis using more grease in the process. It is now time to focus on building all 4 of the suspension units. The TT01 uses friction dampers for ease of assembly; therefore no oil is needed in them. Should you want to at a later date, an oil filled damper kit is available which will give you much scope for tuning the suspension. 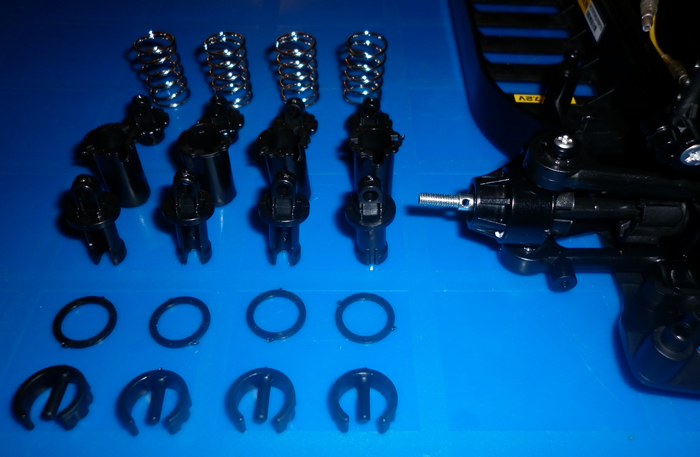 The Tamiya TRF shocks also look much better than the items seen here, although other manufacturers such as Yeah Racing also sell an oil filled damper kit for this chassis. 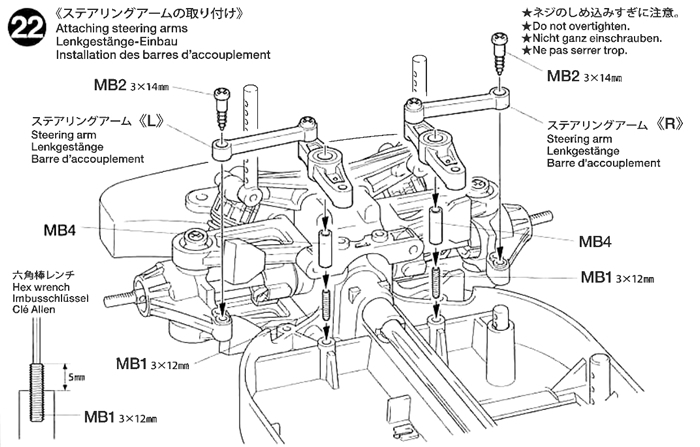 The 19th stage of the build is to attach the suspension units to the car. 8 x MB2 screws make this possible. 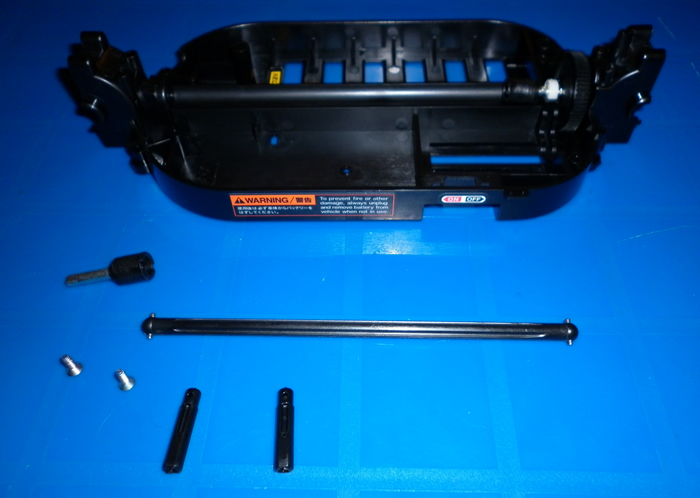 Next on the jobs to do is to assemble the steering arms. 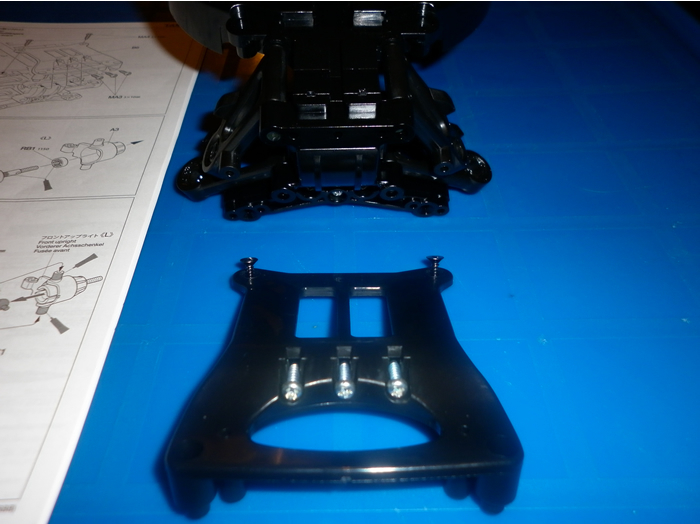 As with this chassis build in general, it is a very simple procedure and should not pose a problem even with someone who is new to building radio controlled cars. The front bumper is now put installed. 2 screws and a clamping plate hold on the bumper. 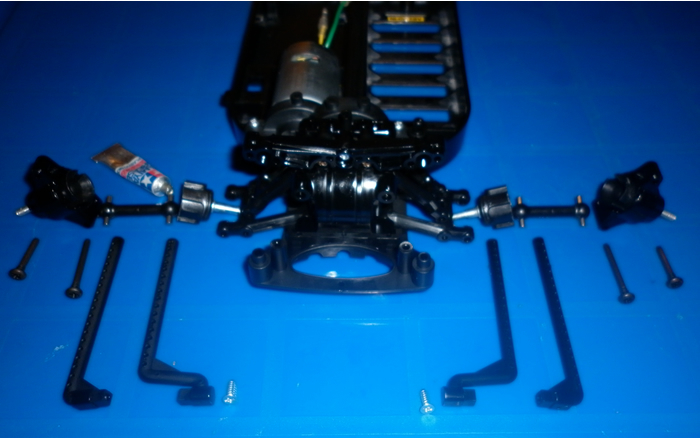 The steering arms are now assembled to the chassis. 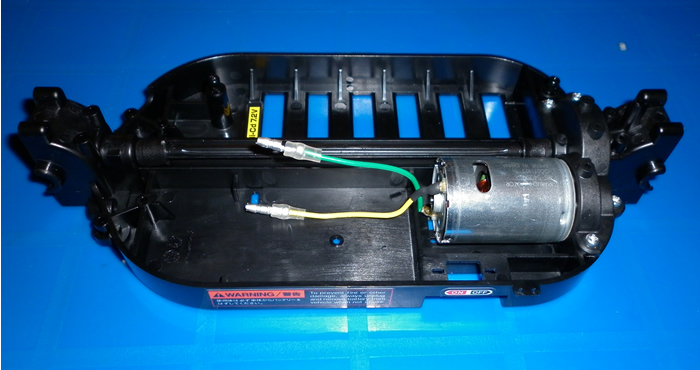 Although I have not taken a picture of it, the next stage in the manual suggests you to charge the 7.2volt battery which will power the cars motor, receiver and steering. Stage 24 of the build involves testing your chosen radio control equipment. As I have extensive knowledge of the hobby already, I knew the equipment I was installing into the TT01 was fully functional and therefore testing was not required. 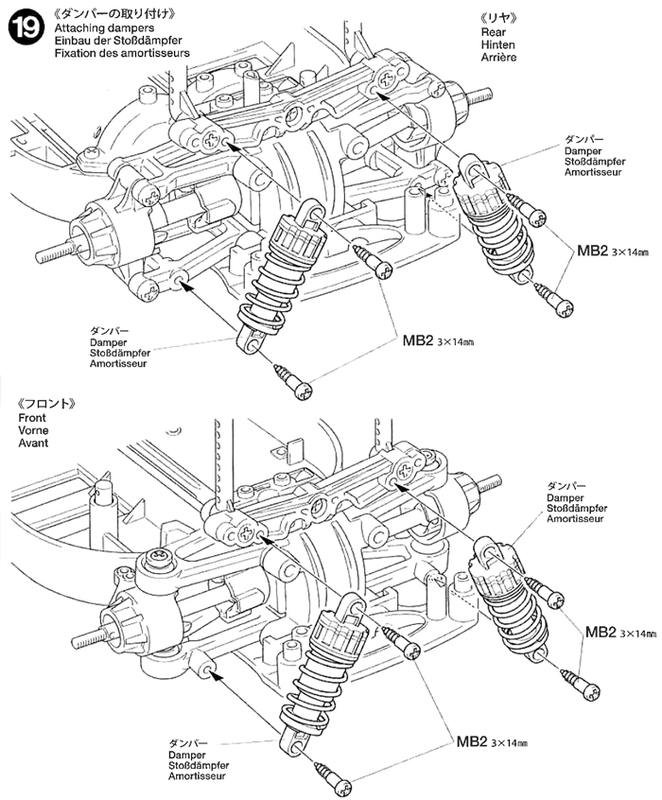 However, the manual is very good in explaining how to connect the receiver; steering servo and Electronic Speed control together and put them into the car. The stage covered here is to use the correct part on the end of the servo as different manufacturers use different fittings to connect the servo to the steering output linkage. 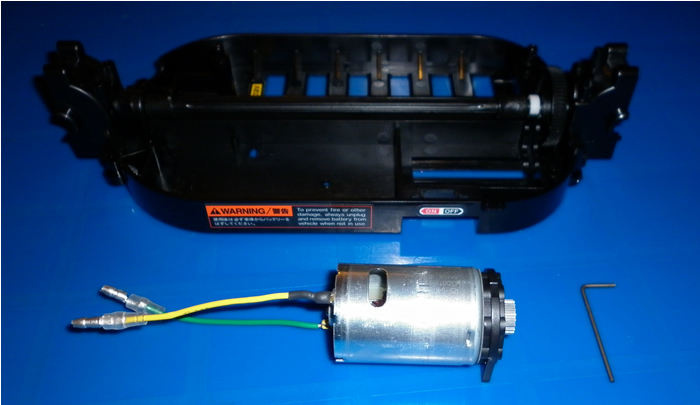 Different manufacturers tend to use a different number of splines on their servos. 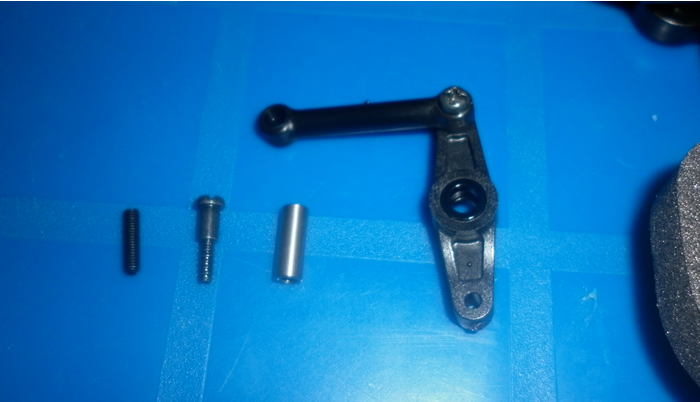 This, in turn dictates which piece you then push onto the end of the servo to build up the steering arm assembly. The next task is to install your chosen Electronics into the chassis. For my build I chose to use an Acoms Techniplus 27Mhz receiver, Acoms AS12 servo and the kit supplied Tamiya Electronic speed controller. I also soldered and heat shrinked a deans type connector on the speed controller power wires, as I felt these are a little more robust than the Tamiya supplied item. Fusion Hobbies have a wide range of transmitters, receivers, servos and Speed controls in stock to assist you in the build of your car. The transmitter and receiver are usually supplied together and are available in either typically 27MHz, 40Mhz or 2.4GHz. We are happy to answer any questions you may have about the suitability of a radio system for your intended car. The latter 2.4 systems do not use crystals in the transmitter or receiver and are typically more expensive due to their construction, but are the most modern and convenient in design. Although building a new car and putting your own electrics into it can be a very daunting experience for some, I would say it is no more difficult than the mechanical construction of the car providing you follow the instructions that come with it. Once the electronics are fitted, it is then time to install the upper chassis which makes the chassis in general a little stiffer. 8 screws complete this stage. 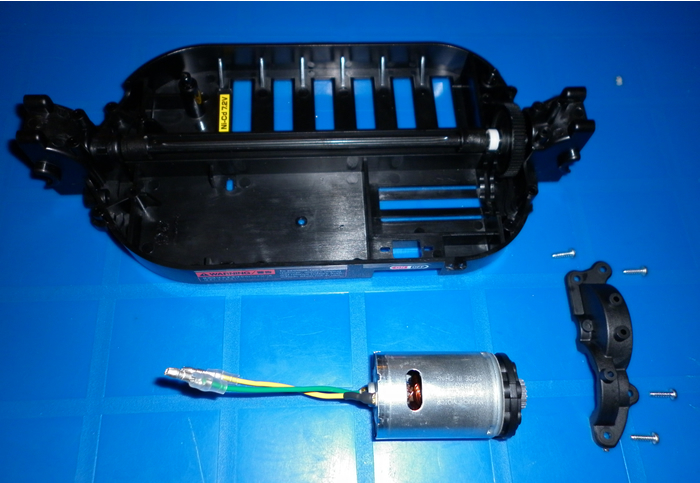 Almost completing the build now, 3 screws are used to secure the motor guard. Note a longer screw (supplied in the kit) may now be needed. The next stage is to mount the kit supplied tyres to the wheels. A little bit of superglue is needed (use a tiny spot of glue every 2 cm around the inside and outside of the wheel tyre assembly) or the tyres will come off of the wheels. If you do not use much glue you may then later be able to replace the tyres using the same wheels as and when the tyres wear out. The tyres supplied appear to work well on carpet with the standard kit supplied 540 motor. They will probably wear a little faster outside on concrete or asphalt though due to the fact that they are quite soft and use no foam inserts. Next is to attach all four of the wheels on to the chassis. 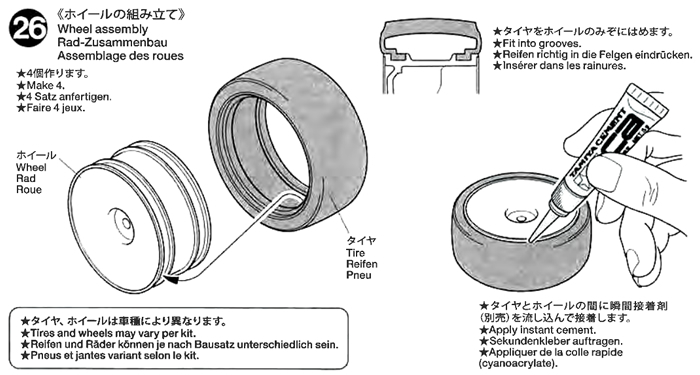 Note more use of grease inside/on the outer hub bearings. At this point, I would cut out the body shell and test that the shell fits ok onto the car, adjusting the body pins on the posts to suit the best position. Once this has been established, take the body shell off and wash it in very slightly warm water with a small drop of washing up liquid. The reason for doing this is to remove any grease that may have accidentally been put onto the inside of the body shell, preventing the paint from staying on. Then, rinse it out and allow time for it to dry. Once dry, the shell can then be masked (using the window masks supplied with the kit) and sprayed. I used Tamiya metallic blue spray paint in a can, to replicate the 2008 World rally car shown on the box of the kit. A little tip is If you spray the shell 2 or 3 times lightly, it will produce a better result than simply spraying the whole can all in one go onto the shell. Once you have allowed time for the paint to dry, you can then peel off the window masks and the outer protection sheet which is put on at the moulding factory. The latter stops any drift spray going onto the outside of the shell and spoiling its look. It serves a very useful function but MUST be peeled off before you start applying the included sticker sheet! Before stickers are applied, I would ensure you follow the separate A4 sheet which for this body shell, describes how to fit the air scoop at the top of the car, the wing mirrors and black rear spoiler which really adds depth to the realism side of things! There are over 100 stickers to apply to the body shell of the car and obviously it will take a lot of careful placing and time to get this right. 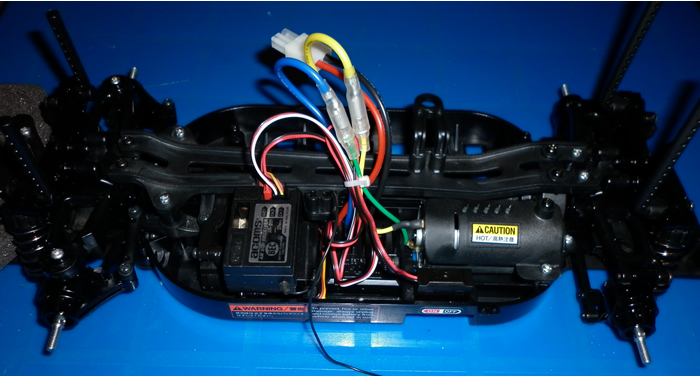 Although the car in the review does not show the light kit (as it is a little too real for my liking and I would not be using the car in the dark so I opted not to fit it) the instructions are very detailed in how to mounting it and connecting it to the 7.2 volt battery in the car. The end result of your hard work is a car that looks real, is fun to control and will hopefully last you for a long time! Should you wish to purchase this kit, or a similar one, please contact us for product prices and further information. As and when you wish to make your TT01 look better and go faster, there are a list of part numbers included with the kit to help you. 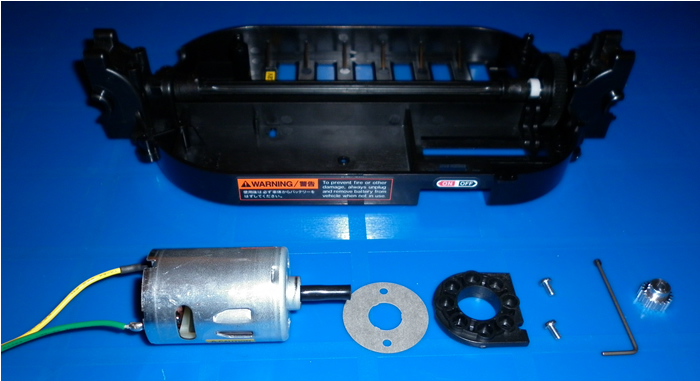 1) a ball bearing set to improve the reliability and durability of the transmission (which is the first thing I would suggest you do if you are looking to upgrade the motor to a faster type). 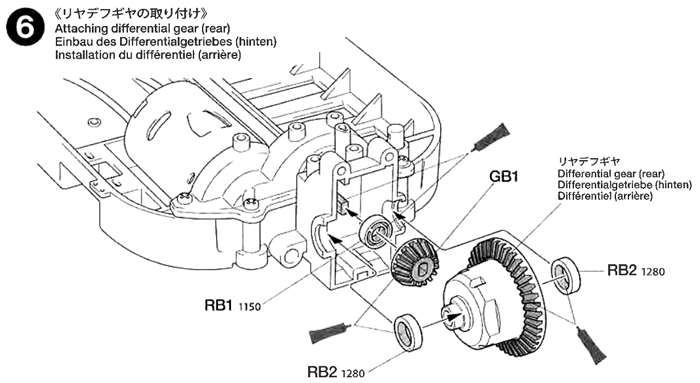 2) Different pinion and spur gears to change the acceleration and top speed of your car. 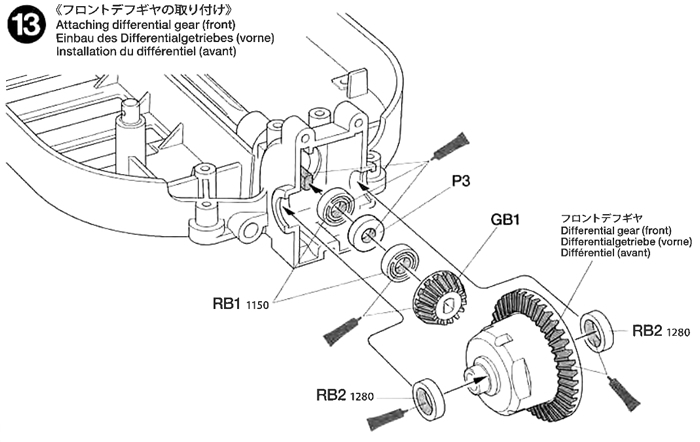 A lower toothed pinion gear will give quicker acceleration. 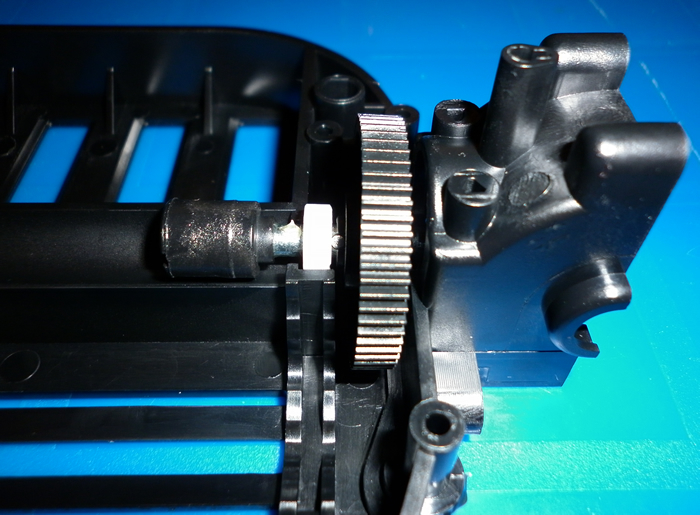 A bigger toothed pinion gear will give a better top speed, but at the cost of a slower acceleration time. 3) TRF damper set – these are metal, oil filled suspension units which enable you to fine tune the cars suspension easier than the kit supplied friction dampers. 4) Turnbuckle tie rod set – these will enable you to set toe in or toe out on the front wheels to suit your driving style. 5) Various blue metal parts to improve the look, including a blue propeller shaft to further improve the strength of the link between the two sealed gearboxes. We at Fusion Hobbies will be happy to assist you in the maintenance parts, or upgrade process of a TT01, or in fact any of the cars we supply.